Maize needs sufficient rain around the maize flowering time if it is to be fertilised and develop cobs. This year, a number of regions had no rain, and many maize crops are therefore under drought stress. These crops are frequently without cobs but contain a lot of sugar. Maize plants with green leaf mass are capable of regenerating if they get rain, but in this case the risk of infestation with Fusarium fungi must be carefully monitored. Harvest the maize quickly if necessary. A proper assessment of crops is essential if yields are to be maximised. The dry matter content may increase by about 2–4%, depending on drought stress and weather conditions. However, this increase may be substantially higher if crops are already damaged. If the lower leaves of maize plants are already withered, the weekly increase in dry matter content is above 2–4%. The more leaves are dried out, the less assimilation surface remains for the plant. In this case, rain causes the ensiling properties to deteriorate, as Fusarium fungi and yeasts rapidly colonise the dried plant parts. Consequently, affected maize crops should not be chopped off too low during the harvest. The nutrient metabolism in plants is substantially impaired if their leaves start to roll up due to drought stress. Once plants have withered substantially (40–45%), crops with few or no cobs need to be harvested at the latest. Harvesting drought-stressed maize is challenging: withered leaves impair proper compaction, while excessively moist vegetative parts (DM below 27%) result in the formation of silage effluent. Chop lengths of 6–8 mm and the deposition of 15 cm thick layers are particularly important in silage management. 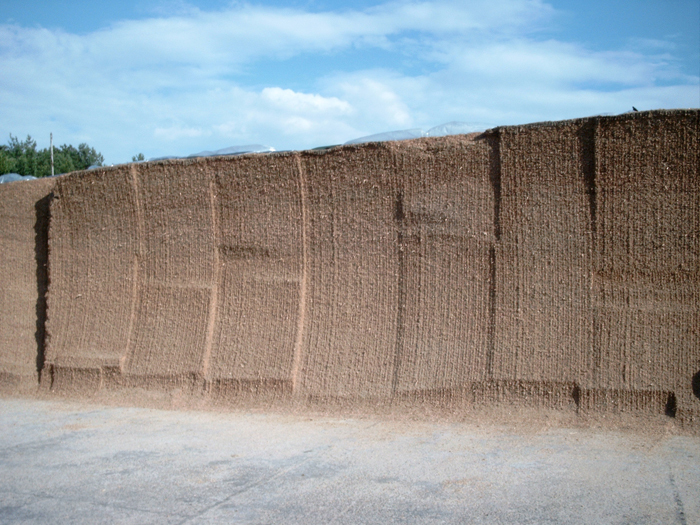 Using silage additives is indispensable for producing aerobically stable silages and suppressing fermentation pests. If forage has a dry matter content below 27%, the use of BONSILAGE MAIS is recommended. With dry matter contents above 27%, both BONSILAGE SPEED M and BONSILAGE FIT M can be used. Since BONSILAGE SPEED M allows silages to be opened after an ensiling period of only 14 days, this silage additive is highly recommended in view of the expected feed shortages. Do you have any questions, requests or suggestions? We look forward to hearing from you! Correct silage management is the basis for high silage quality. Find useful tips on ensiling maize here.